More than 40 years ago, Harvard courses in computer science and mathematics helped shape the innovator Bill Gates ’77, LL.D. ’07, would become. 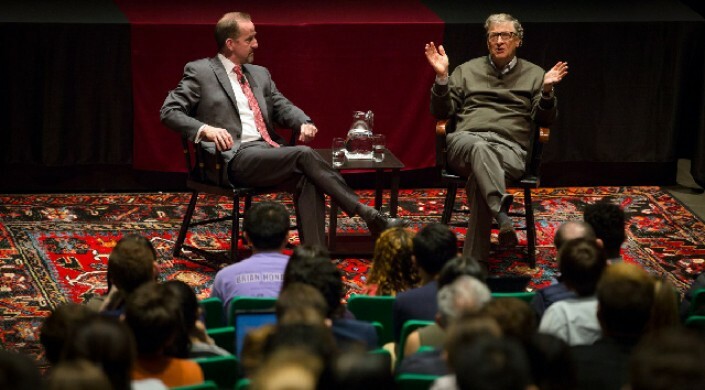 On April 26, the Microsoft co-founder again found himself sitting in a packed Harvard lecture hall, but this time he was sharing insights and anecdotes with current students. The wide-ranging Q&A session was co-hosted by Frank Doyle, dean of the John A. Paulson School of Engineering and Applied Sciences (SEAS), and University Provost Alan Garber. Garber introduced Gates as a friend and former classmate, highlighting both his remarkable technical and business achievements, and also drawing careful notice to his philanthropic work. “Few people have had the same impact on mortality and human well-being as Bill Gates,” he said. Since the Bill and Melinda Gates Foundation began funding the distribution of antibiotics to children in Africa, there has been a 13 percent decrease in child mortality rates across the continent, he added. Doyle began the question and answer session by asking Gates to reflect on the work being done in the SEAS robotics labs they toured together that morning: the Harvard Biodesign Lab, led by Conor Walsh, John L. Loeb Associate Professor of Engineering and Applied Sciences, and the Harvard Microrobotics Lab, led by Rob Wood, Charles River Professor of Engineering and Applied Sciences. Gates learned about a wide range of cutting-edge projects, from the micro-scale Robobees to soft robotic sensory gloves. Doyle continued to focus the conversation on Harvard, asking Gates about his years as an undergraduate. Harry Lewis, Gordon McKay Professor of Computer Science, was one of Gates’ teachers and recalled his student’s voracious reading. He lamented the long period of time while Microsoft was growing that he wasn’t able to read and learn as much outside of his narrow focus, but now he takes three to four online college courses a year. Building off that discussion, Doyle asked Gates for his opinion on MOOCs (massive open online courses). “Education is a social construct,” Gates said. If a student so desires, he or she can pick up a Physics 55 textbook and read it, as Gates did, and learn on his or her own, purely for the sake of learning. When the Q&A session was opened up to the student audience, a freshman lamented the lack of scientific literacy in politics, a Harvard Graduate School of Education student and middle school arts teacher asked Gates his opinion on teacher pay, and a sophomore recipient of the Gates Millennium Scholarship was able to publically thank Gates for funding her education. Gates spoke about his foundation’s successes in improving mortality rates in developing world and in eradicating polio. He also discussed his foundation’s lack of progress – so far – in significantly improving America’s public education system. He went on to mention the necessity of avoiding wars, and being more prepared as a nation for the possibility of pandemics. Gates connected with the audience, often making students burst into laughter at his candid anecdotes about his Harvard experience, from the shock of not placing first in a class—Honors Abstract Algebra (Math 55)—to choosing a house based on the frequency with which he could order hamburgers at every meal. At the end of the Q&A, Gates was asked what he would study if he returned to Harvard as a student today. Join Bill for a wide-ranging student Q&A hosted by Provost Alan Garber and Dean Frank Doyle. Bill will take questions from the in-person audience about various areas of his work – global health and development, technology, clean energy innovation, Alzheimer’s research, philanthropy, and education – as well as current events, his favorite books, and why he loves coming back to Harvard four decades after he dropped out.